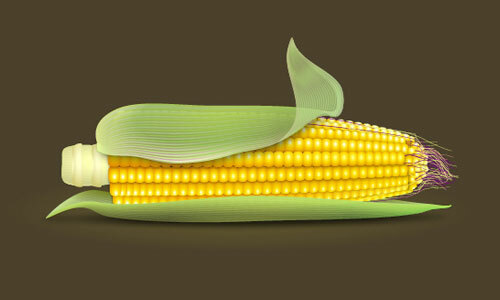 In the following steps, you will learn how to create a nice corn illustration. You’ll see how powerful blending can really be! First, we’ll be creating base shapes using the basic tools. 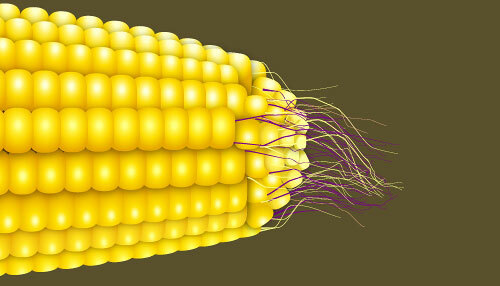 Fill them with gradients and create the blended objects. Finally, add the details using some cool effects and the Transparency Palette. 1. 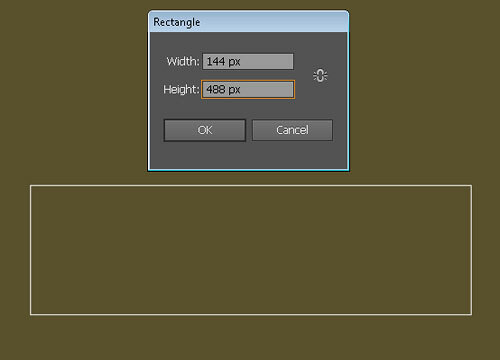 Pick the Rectangle Tool (M) from the Tool Palette and create a 144px by 488px object. 2. Based on the newly created rectangle, we’ll create a blue object as shown in the image below. 3. Remove the rectangle and fill the blue object with the linear gradient. 4. 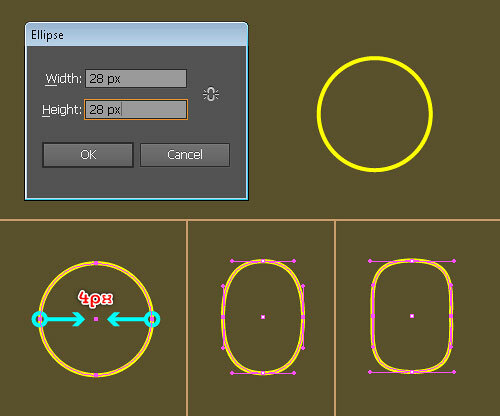 Pick the Ellipse Tool (L) from the Tool Palette. Use this tool to create a 28px by 28px object. 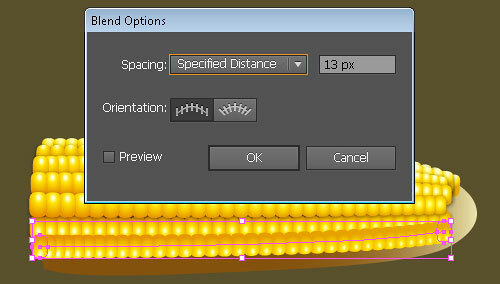 Reselect the ellipse, pick the Direct Selection Tool (A) from the Tool Palette, click on the left anchor point and move it 4px to the right. 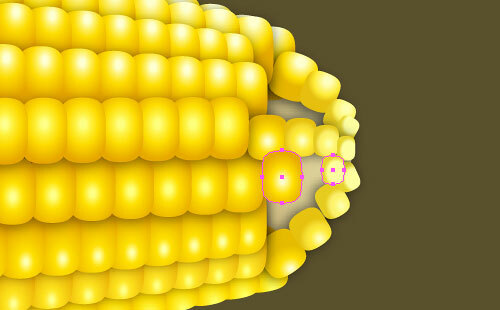 Then, select the right anchor point and move it 4px to the left. 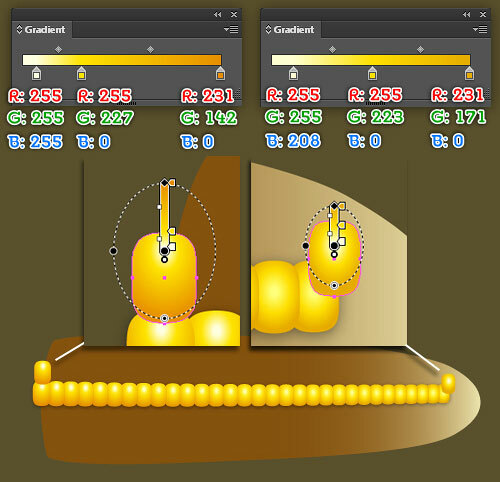 Finally, adjust the handles of the top anchor point and the bottom anchor point to get the result as shown in the final image below. 5. 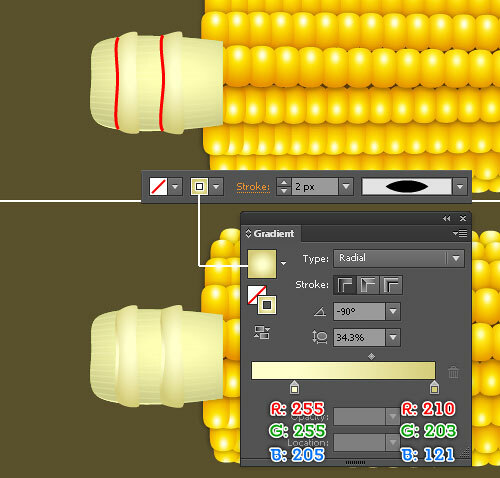 Fill the newly created object with the radial gradient. 6. Keep the newly filled object selected. Go to the Object > Transform > Scale. Select Uniform and enter a 75 in the Scale box and then click Copy. Next, replace the existing color of the duplicate with the new radial gradient. 7. 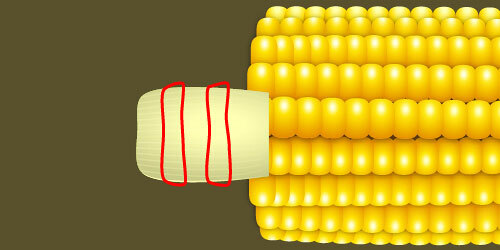 Place two “corn kernel” objects to the positions as shown in the image below. 8. 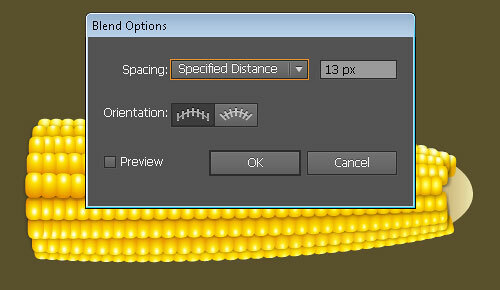 Reselect both the two “corn kernel” objects and go to Object > Blend > Blend Options. 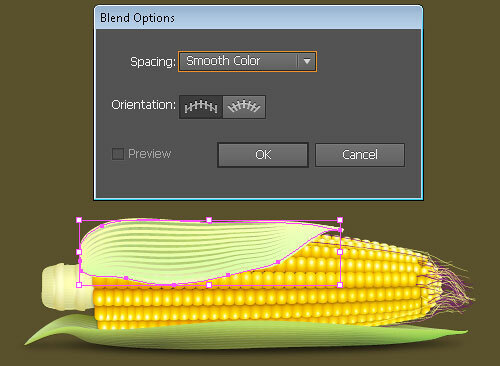 Enter the data as shown in the image below and click OK. Next, go to Object > Blend > Make (Ctrl +Alt +B). 9. 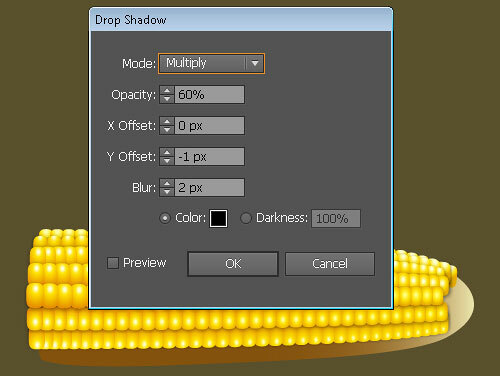 While the blended objects are selected, go to the Effect > Stylize > Drop Shadow. Enter the data as shown in the image below and click OK.
10. 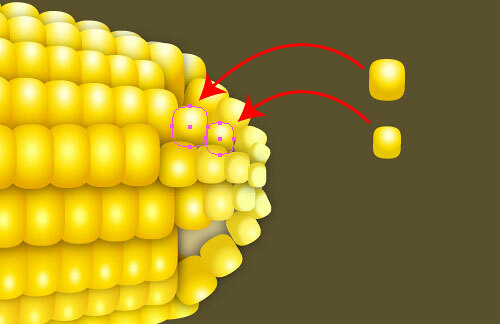 Continue to create two “corn kernel” objects and place them to the positions as shown in the image below. 11. Create a blend between the two newly created objects. 12. Add the Drop Shadow effect for the result. Send it backward (Ctrl +Left Square Bracket). 13. 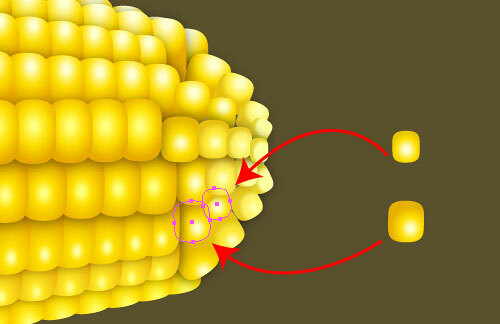 Continue to create the other “corn kernel” objects and then repeat the same techniques as you did on the previous steps to get the results as shown in the image below. 14. Once done, your artwork should look like the image shown below. 15. 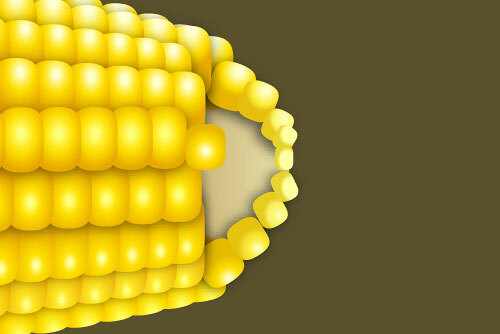 Now we’ll create the smaller corn kernels at the top of the corncob. 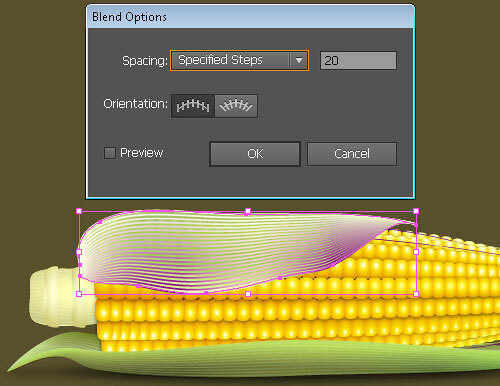 First, double-click on the blended objects created in step 9. 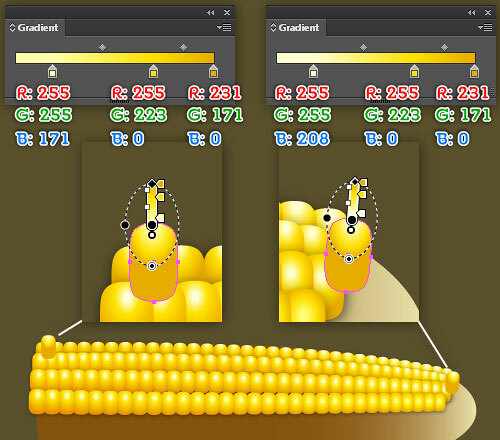 Select the bigger “corn kernel” object and copy it (Ctrl +C). 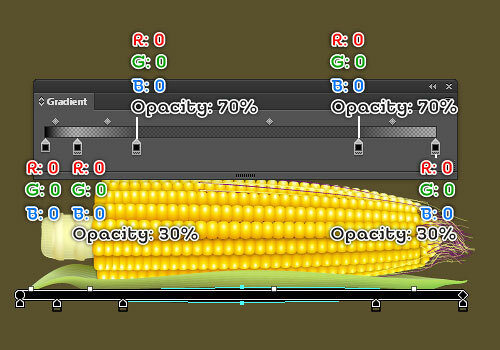 Next, double-click on anywhere outside of the blended objects and press (Ctrl +F) to paste the duplicate in front. Keep the duplicate selected. Go to the Object > Transform > Scale. Select Non-Uniform, enter a 75 in the Horizontal box and enter a 55 in the Vertical box and then click OK. Finally, replace the existing color of the result with the new radial gradient. 16. Keep the newly filled object selected. Go to the Object > Transform > Scale. 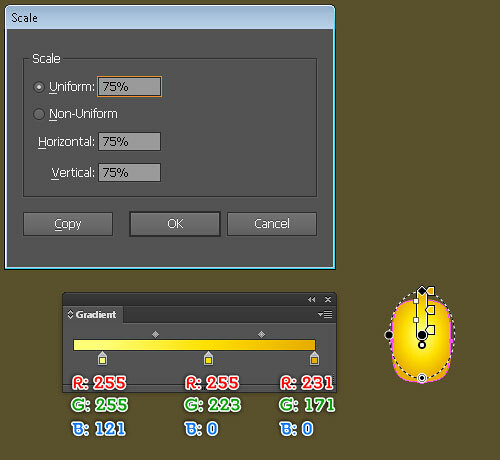 Select Uniform, enter a 50 in the Scale box and then click Copy. Next, replace the existing color of the duplicate with the new radial gradient. 17. Rotate the two newly created objects to an angle of about -20 degrees. Place them to the correct positions as shown in the images below. 18. Create a blend between the two newly created objects. 19. 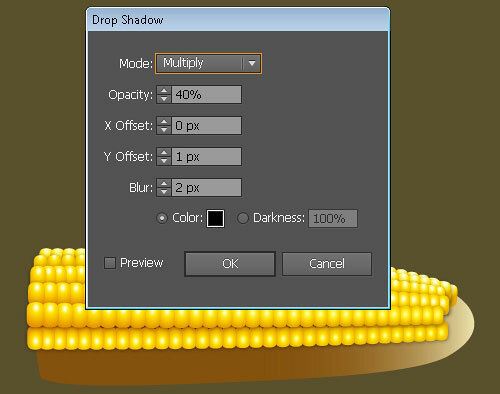 Add the Drop Shadow effect for the newly blended objects. 20. 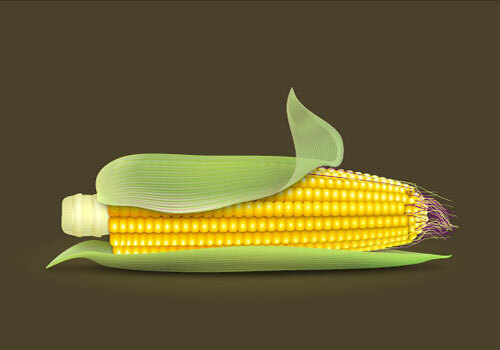 Continue to create the other “corn kernel” objects. 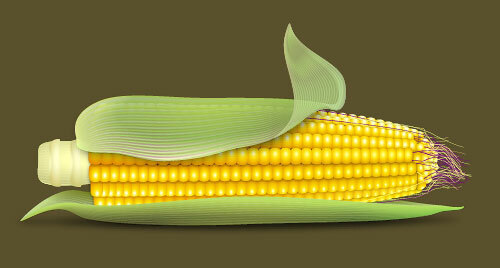 Blend them and add the Drop Shadow effect for the blended objects. 21. 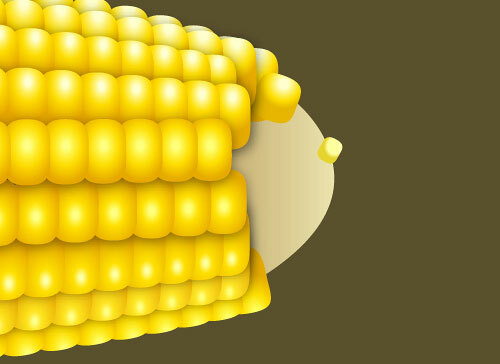 Fill the remaining blanks at the top of the corn with different corn kernels. 22.Once done,your artwork should look roughly like the image shown below. 23. Pick the Rectangle Tool (M) and use this tool to create a 88px by 55px object. 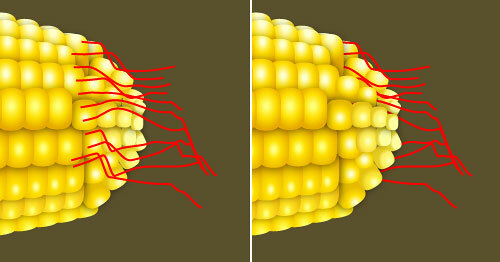 Based on the newly created rectangle, we’ll create a red object as shown in the second image below. 24. 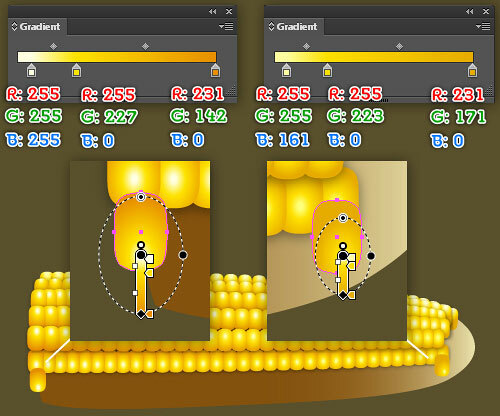 Place the newly created object to the correct position as shown in the first image. Fill it with the radial gradient. 25. 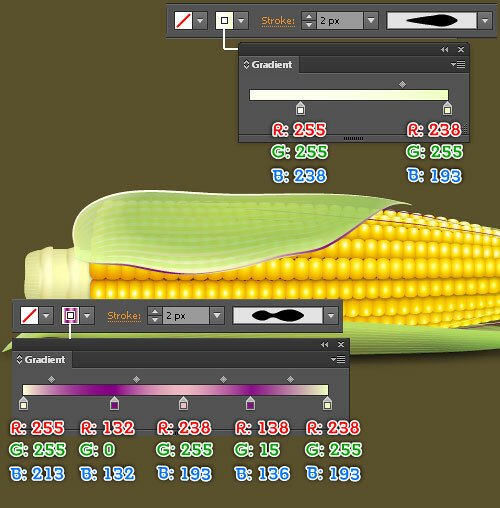 Pick the Pen Tool (P) from the Tool Palette. 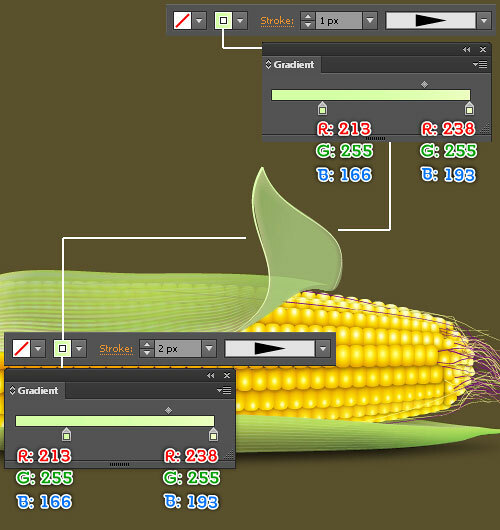 Use this tool to create a curve and set the data for the curve as shown in the images below. 26. Keep working using the Pen Tool (P). 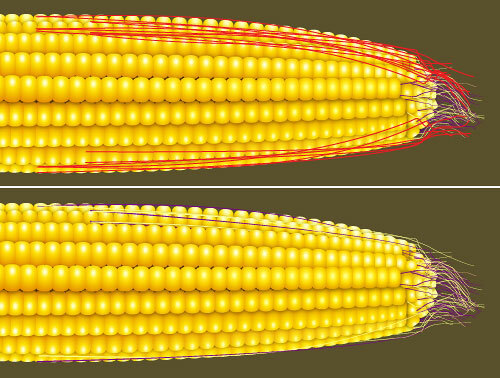 Use this tool to create two curves and then set the data for these curves as shown in the images below. 27. 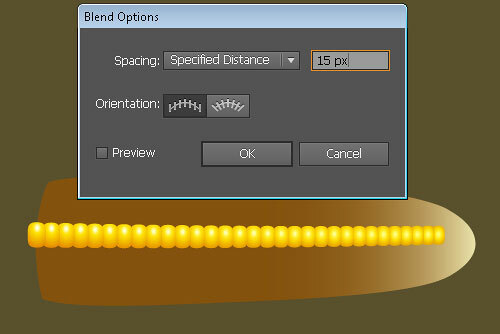 Create a blend between the two newly created curves. 28. 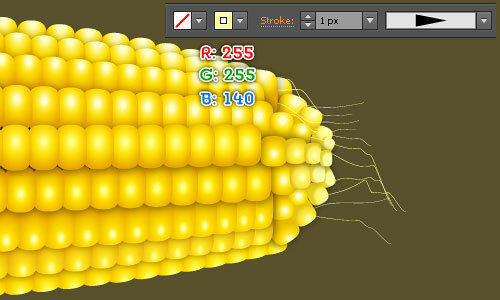 Now, select the object created in step 24, copy it (Ctrl +C) and press (Ctrl +Shift +Alt +V) to paste it on all Artboards. Keep the duplicate selected. Hold down the Shift key, click on the newly blended objects and go to Object > Clipping Mask > Make (Ctrl +7). 29. 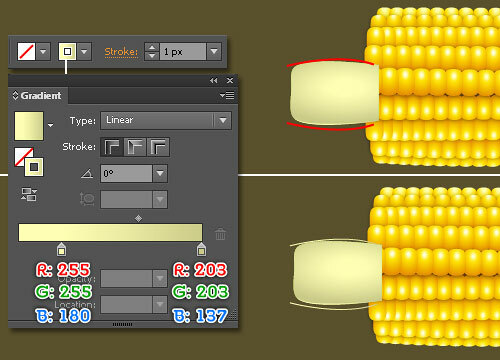 Use the Pen Tool (P) to create two objects as shown in the image below. 30. 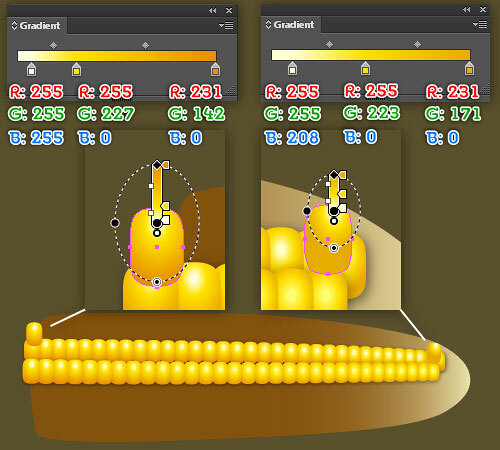 Fill the two newly created objects with the radial gradient. 31. Continue working using the Pen Tool (P). 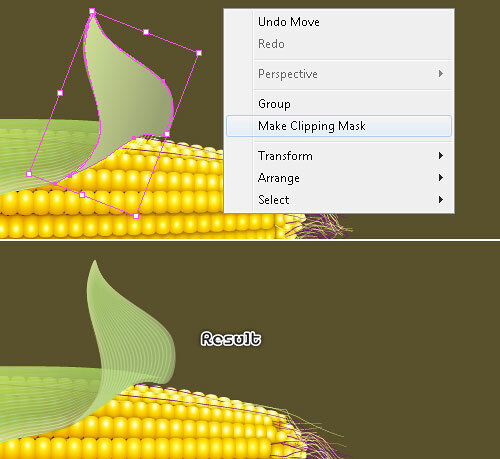 Use this tool to create two curves and set the data for these curves as shown in the images below. 32. Reselect the two newly created curves and go to the Effect > Blur > Gaussian Blur. Enter a 4 pixel Radius and then click OK.
33. By this time, your artwork should look like the image shown below. 34. 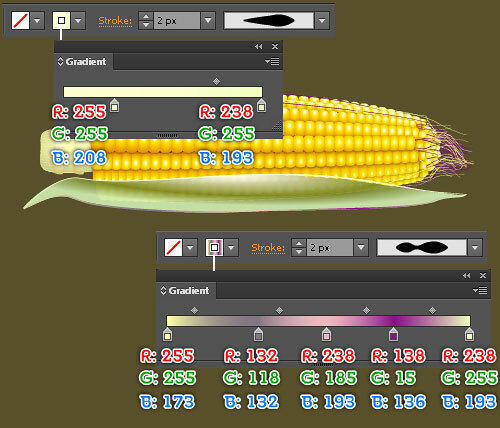 Pick the Pencil Tool (N) from the Tool Palette. 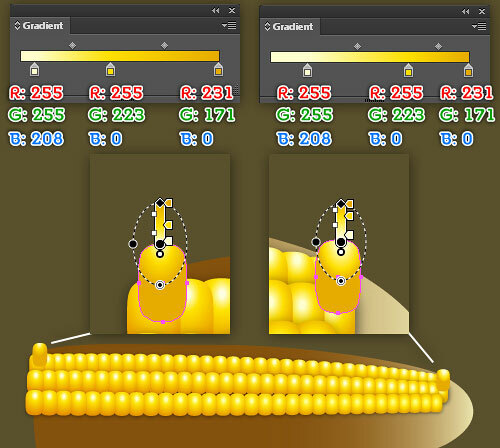 Use this tool to create curves as shown in the first image below. Next, send some curves backward and send the remaining curves to the back as shown in the second image below. 35. Reselect the newly created objects and set the data for them as shown in the image below. 36. 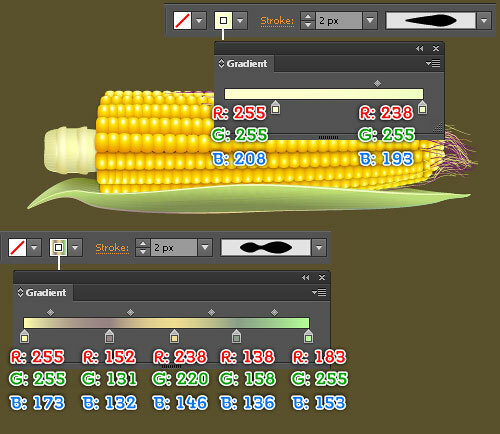 Continue to create “corn silk” objects and set the data for them as shown in the images below. 37. Once done,your artwork should look roughly like the image below. 38. 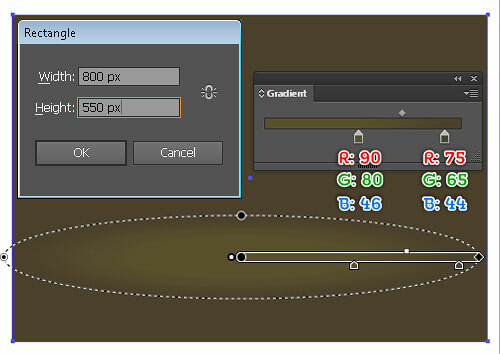 Use the Pen Tool (P) to create an object as shown in the image below. 39. 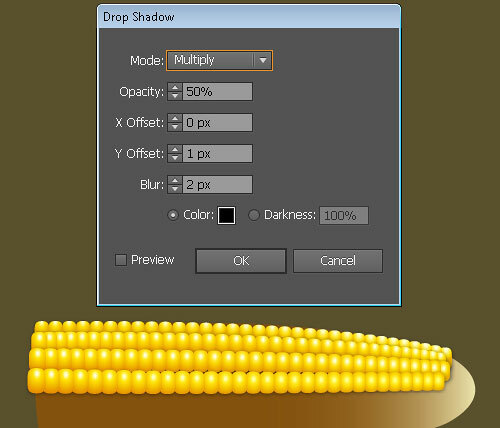 Fill the newly created object with the radial gradient. Next, lower the Opacity of the result to 90%. 40. 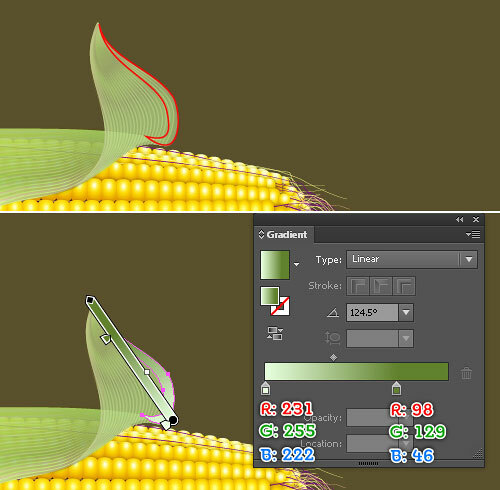 Use the Pen Tool (P) to create two curves. 41. Set the data for these curves as shown in the image below. 42. 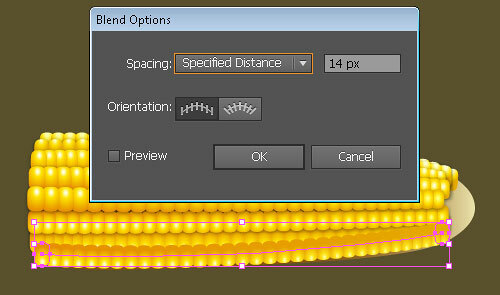 Create a blend between the two newly created curves. 43. 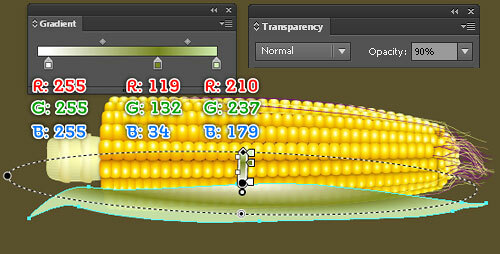 While the result is selected, open the Transparency Palette (Window > Transparency). 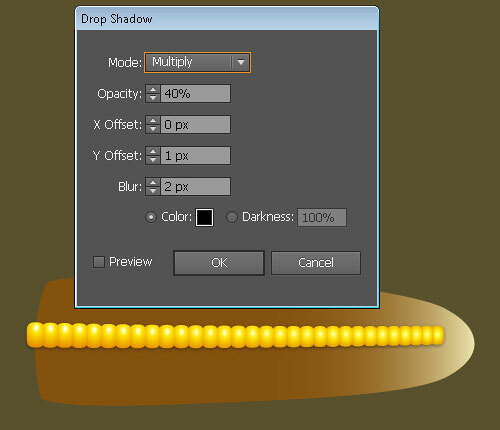 Select Multiply in the Blending Mode and enter a 90 in the Opacity box. 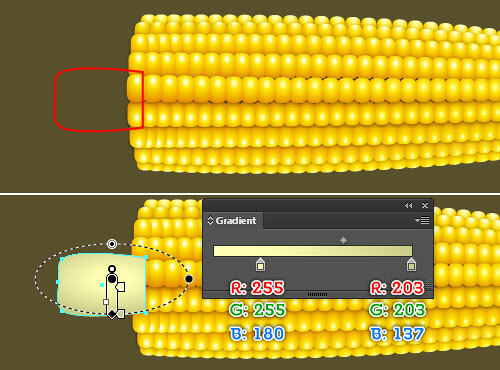 Finally, select and group (Ctrl +G) all the objects created from step 38 up to this time. Send this group to back (Ctrl +Shift +Left Square Bracket). 44. Continue using the Pen Tool (P). Use this tool to create an object as shown in the image below. 45. 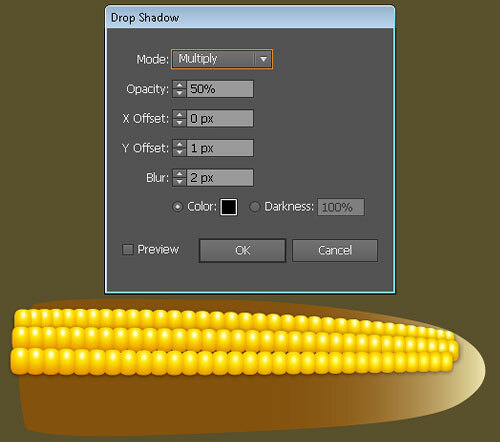 Fill the newly created object with the radial gradient. 46. 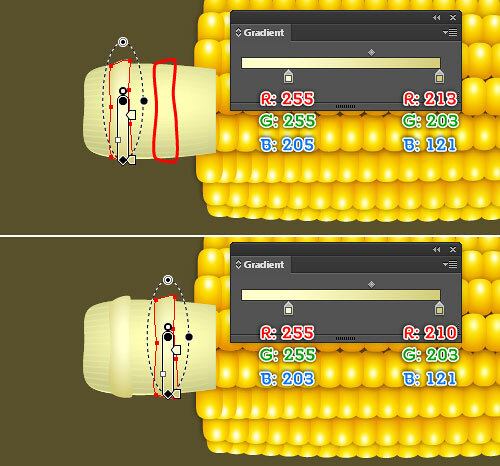 Continue to create two curves and set the data for them as shown in the images below. 47. 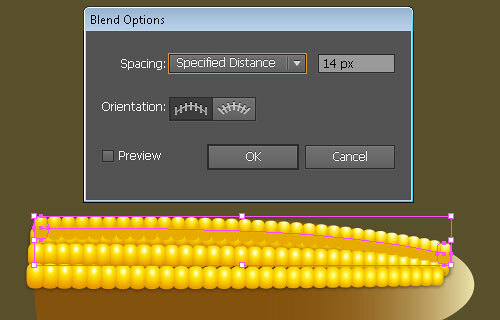 Create a blend between the two newly created curves. 48. 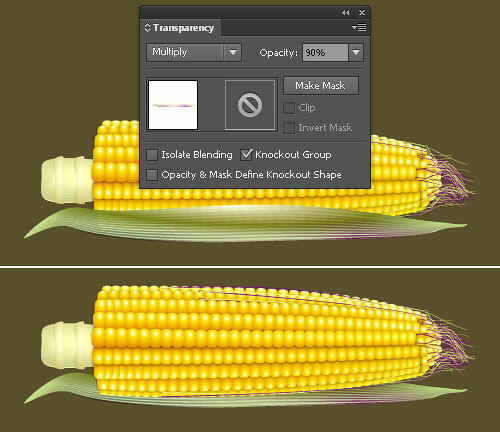 Keep the result selected and open the Transparency Palette (Window > Transparency). 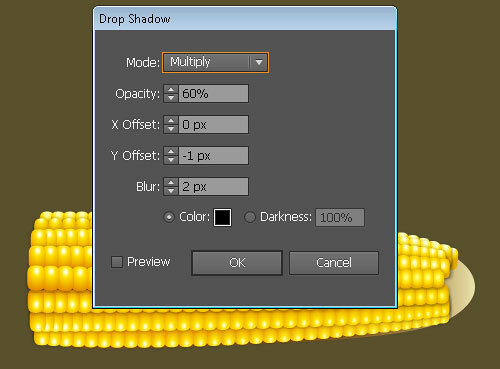 Select Multiply in the Blending Mode and enter a 90 in the Opacity box. 49. 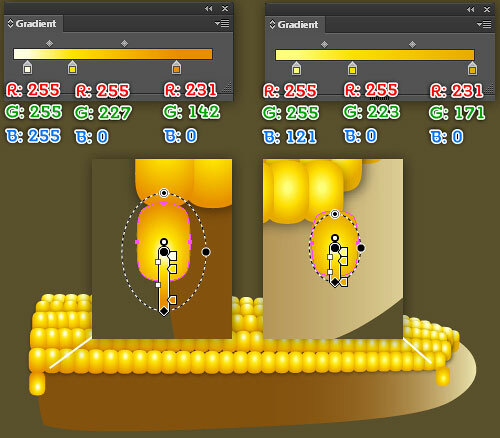 Use the Pen Tool (P) to create an object as shown in the first image. Fill it with the linear gradient. 50. 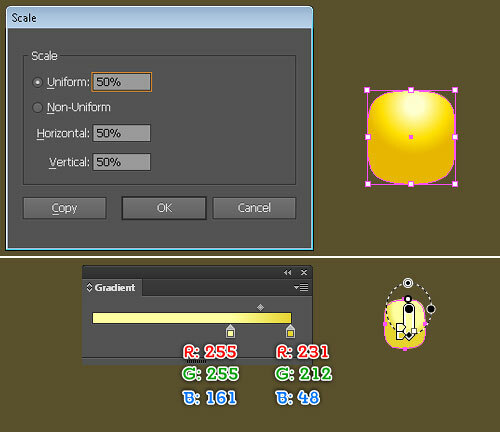 Add the Gaussian Blur effect for the newly filled object and send the result to back (Ctrl +Shift +Left Square Bracket). 51. Once done, your artwork should look roughly like the image below. 52. 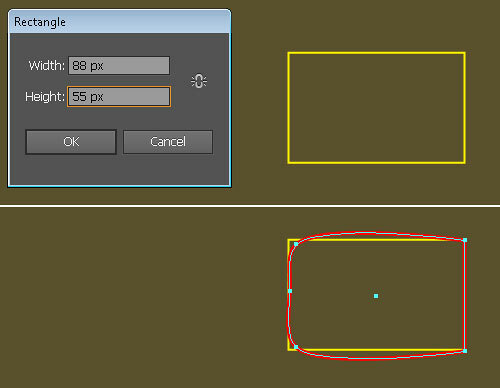 Use the Pen Tool (P) to create an object as shown in the image below. 53. 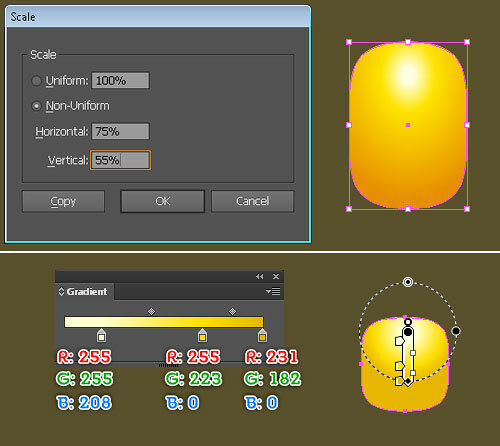 Fill the newly created object with the radial gradient. 54. Keep working using the Pen Tool (P). Use this tool to create two curves as shown in the image below. 55. Set the data for these curves as shown in the image below. 56. 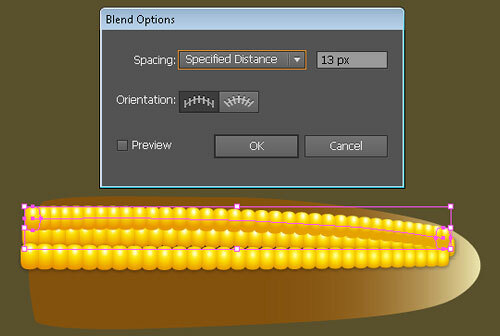 Create a blend between the two newly created curves. 57. Keep the result selected. 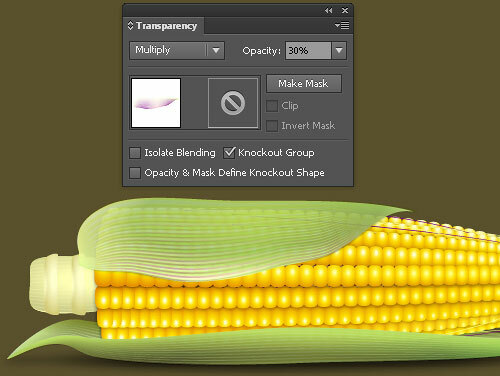 Open the Transparency Palette (Window > Transparency). 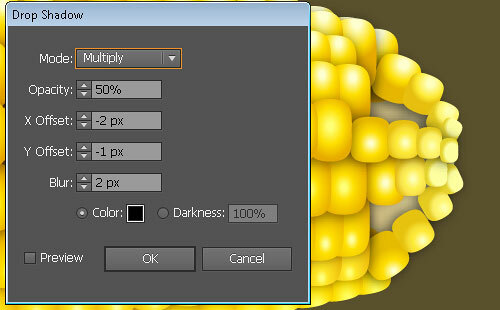 Select Multiply in the Blending Mode and enter a 70 in the Opacity box. 58. 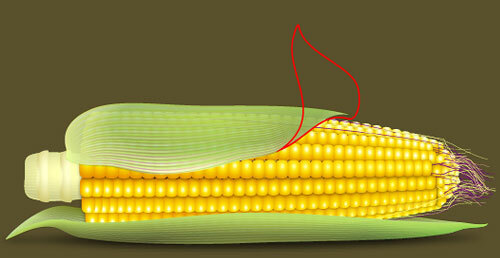 Use the Pen Tool (P) to create two curves as shown in the image below. 59. Set the data for these curves as shown in the image below. 60. 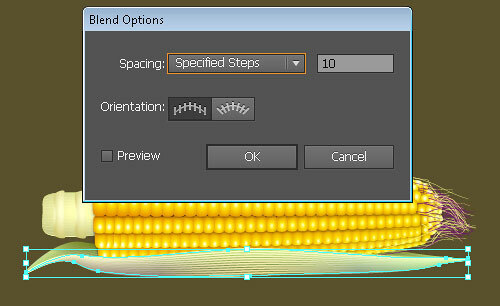 Create a blend between the two newly created curves. 61. Keep the result selected. 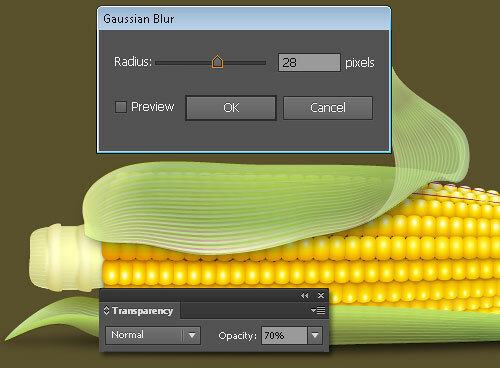 Open the Transparency Palette (Window > Transparency). 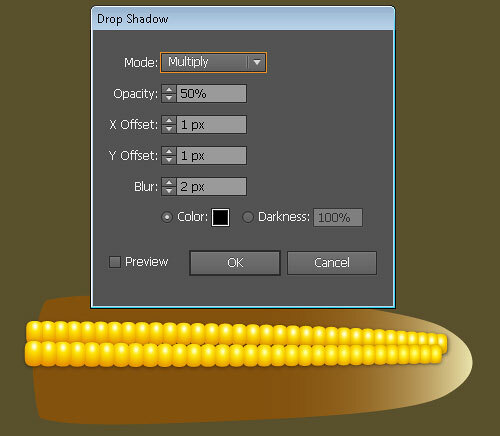 Select Multiply in the Blending Mode and enter a 30 in the Opacity box. 62. 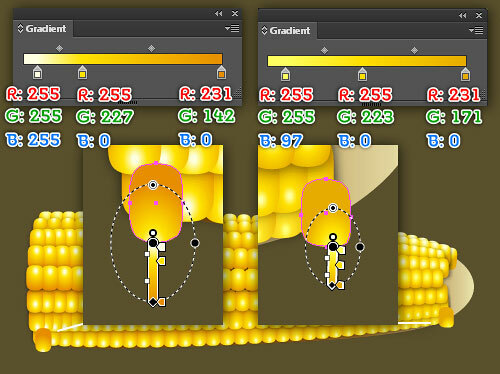 Use the Pen Tool (P) to create an object and fill this object with the linear gradient as shown in the images below. While the result is selected, duplicate (Ctrl +C, Ctrl +F) it and hide the duplicate (Ctrl +3). 63. 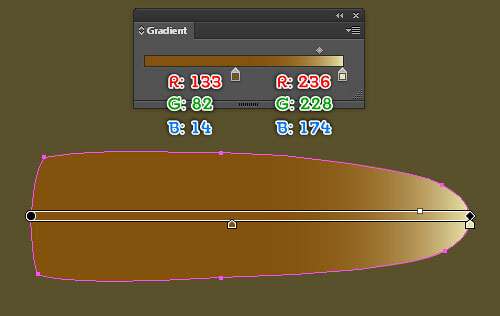 Continue to create an object and then fill it with the linear gradient as shown in the image below. 64. 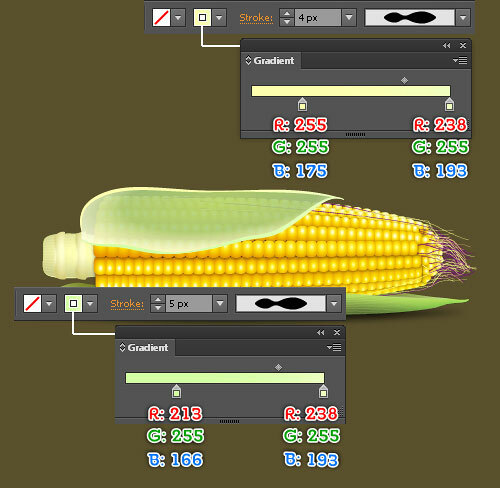 Create a blend between the two newly created objects. 65. Continue working using the Pen Tool (P). Use this tool to create the two curves and then set the data for them as shown in the image below. 66. 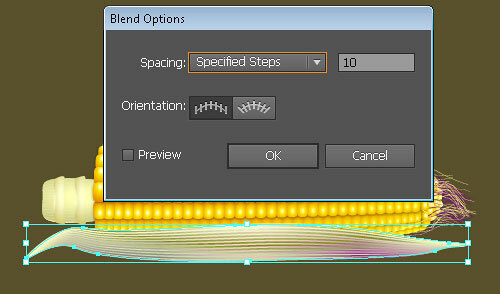 Create a blend between the two newly created curves. 67. Keep the result selected. 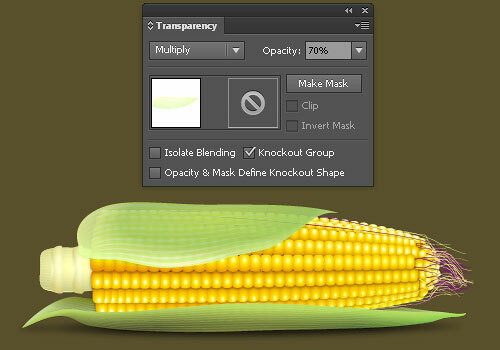 Open the Transparency Palette (Window > Transparency). Select Overlay in the Blending Mode and enter a 90 in the Opacity box. 68. Now press (Ctrl +Alt +3) to show the object hidden in the previous step and bring this object to front (Ctrl +Shift +Right Square Bracket). 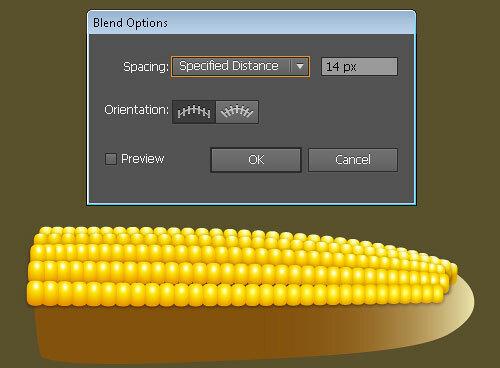 While the result is selected, hold down the Shift key and click on the newly blended objects. Go to the Object > Clipping Mask > Make (Ctrl +7). 69. 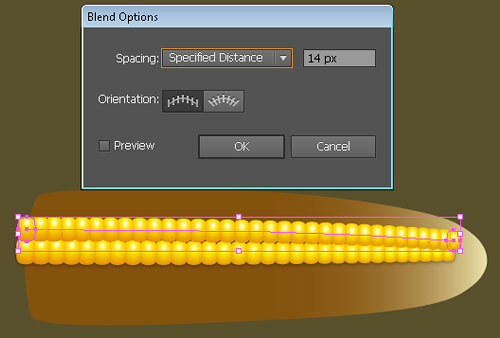 Reselect the newly blended objects and duplicate (Ctrl +C, Ctrl +F) them. 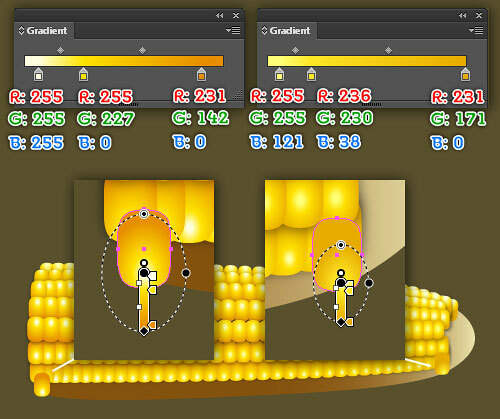 Next, double-click on the duplicate and select the two original objects (two curves). Reset the data of them as shown in the image below. Finally, double-click on anywhere outside of the blended objects you have just edited. 70. 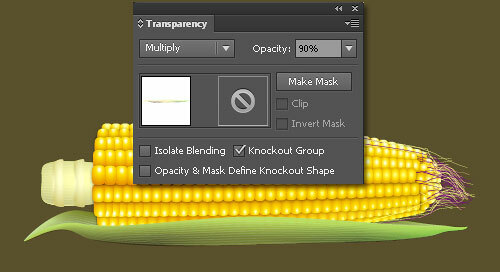 Keep the result selected and open the Transparency Palette (Window > Transparency). 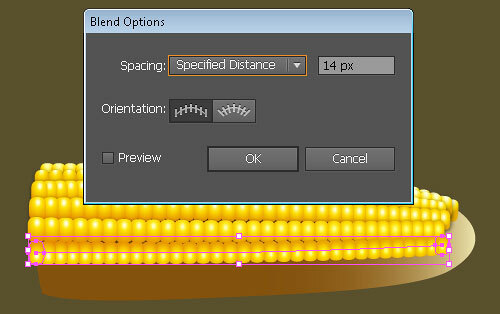 Select Multiply in the Blending Mode and enter a 15 in the Opacity box. 71. 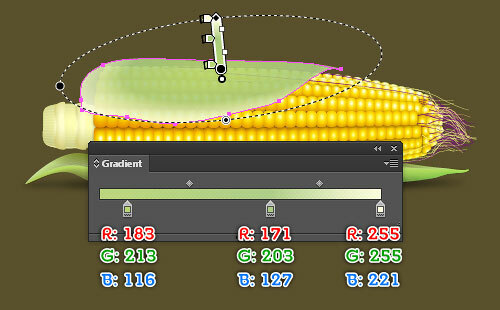 Use the Pen Tool (P) to create an object and fill it with the linear gradient. 72. 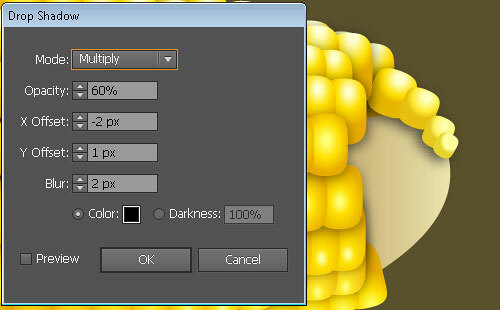 Lower the Opacity of the result to 90%. 73. 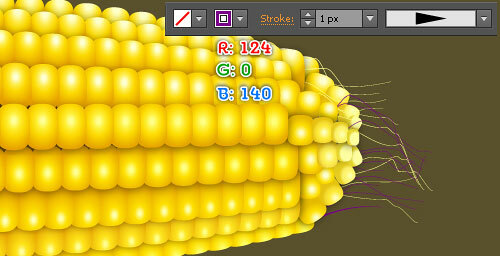 Continue to use the Pen Tool (P) to create an object as shown in the image below. 74. Fill the newly created object with R=35, G=31, B=32. 75. Add the Gaussian Blur effect for the result. Lower its Opacity to 70% and press (Ctrl +Left Square Bracket) several times to get the result as shown in the image below. 76. By this time, your artwork should look like the image shown below. 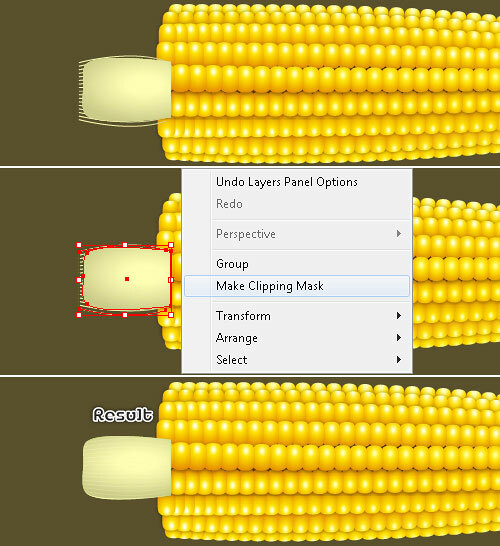 Now, select and group (Ctrl +G) all the objects created from step 1 up to this time. 77. Pick the Rectangle Tool (M) and use this tool to create a 800px by 550px object. 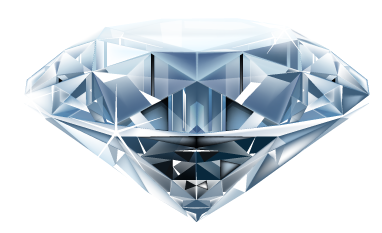 Fill this object with the radial gradient. 78. 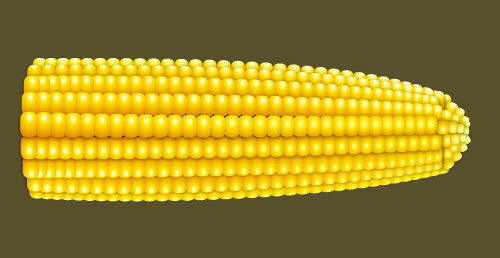 Place the “corn” group to the position as shown in the image below. Congratulations! 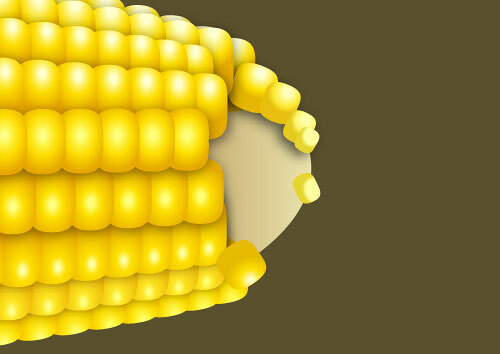 You’ve completed the step by step guide on how to create a corn using illustrator! I hope you’ve discovered some useful things in this tutorial. Enjoy!